Why Does My Garage Door Leak? / Comments Off on Why Does My Garage Door Leak? Is water seeping under your garage door and pooling on the floor? A garage door leak can be caused by a faulty seal, gaps in the concrete floor, clogged gutters or poor drainage. Let’s take a look at some possible causes and remedies for water in the garage. 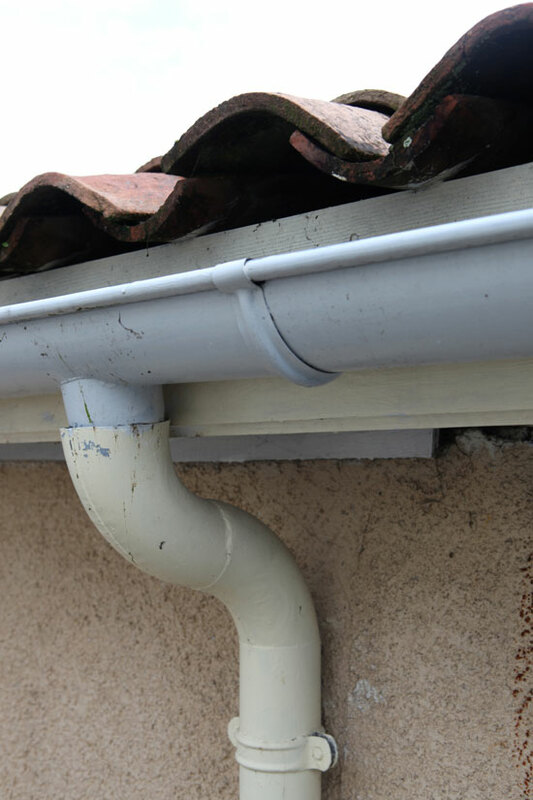 A clogged gutter or downspout can cause a garage door leak. We have a lot of rain in Washington and Oregon. Storms can pelt a garage door with rain for hours and days at a time. The rubber seal that runs along the bottom of the door is meant to keep moisture, dust and critters out. If the seal is worn or broken, it won’t work. You can purchase a new seal at a home improvement or garage-door supply store. Does your garage have gutters and downspouts? Are they clogged with moss, pine needles or other debris? If it looks like the garage door leak is coming from the roof, check the gutters. Clean and repair them if needed. If you don’t have gutters, install them. Attach extensions to ensure the downspouts carry water away from the garage door. Functioning gutters and downspouts will protect not only the garage floor, but also the walls and foundation. A weather seal won’t work properly if the concrete beneath it is uneven. Changes in temperature can cause small shifts in the size and shape of concrete. You can seal gaps by installing a u-shaped weather seal, or astragal, on a retainer clip. The astragal cushions the door and deforms to seal gaps. A variety of seals are available at supply stores, and some types may work better with uneven concrete. A significant garage door leak is most likely a problem with drainage rather than with the door seal. If the driveway is lower than the surrounding soil, water could drain into the garage. A driveway that slopes toward the garage can also create flooding. Water may be diverted away from the garage. Diverting water must be done with care to avoid shifting the problem elsewhere. A drain trench can be cut into the driveway. The water will collect in the trench and flow to the sides of the driveway. Ponderosa offers garage door repairs and tune-ups. Our tune-ups includes an inspection of the major components, including the weather seal, of your door. If it’s time for a new door, call us for an estimate on a new garage door installation.